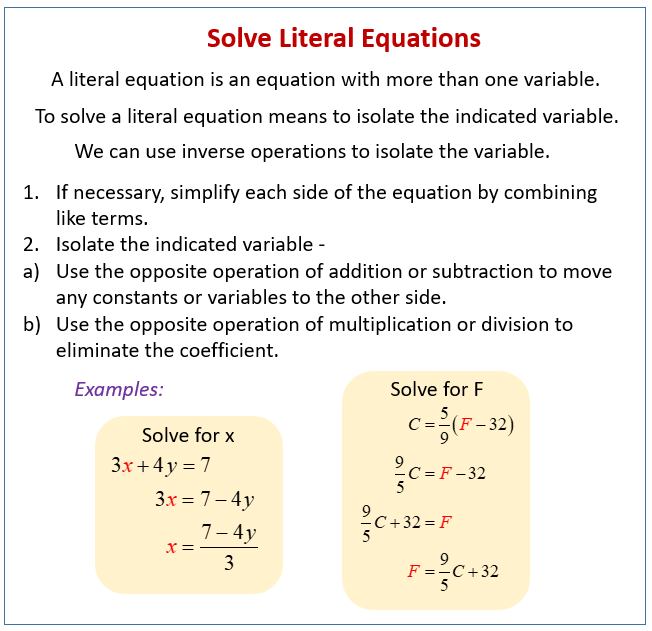 Literal equations are equations with more than one variable. Usually, we need to solve the literal equation for one of the variables. This involves moving all the other variables to the other side of the equal sign. Sometimes we need to use methods for solving literal equations to rearrange formulas when we want to find a particular parameter or variable. Solving literal equations is often useful in real life situations, for example we can solve the formula for distance, d = rt, for r to produce an equation for rate. We will need all the methods from solving multi-step equations. Solving for one variable in a formula. Solve b for the following equations.